Allow you to backstab and parry like Dark Souls. 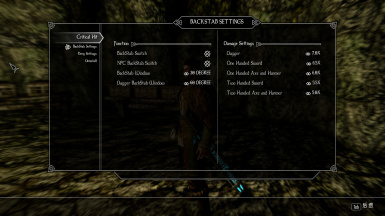 1.Add MCM option to turn off the backstab of axes and hammers. *If you can't activate the backstab animation, try to download and install XP32 skeleton and let it overwrite everything. *We still don't know how to tackle the "instantly killing" problem on the respawned NPCs. 3.Add MCM option to change the backstab window and parry time. 4.Improve some scripts to make it react faster. *There is only one backstab animation for all kinds of melee weapons, because we don't know how to make a new killmove animation. 1.I'm not the author of this mod. FB is, but unfortunately he is too lazy to write the detailed description and upload his mod. 2.Both FB and I are Chinese, so please try your best to understand what I'm talking about if we make any language mistake (or you can help me correct it, for my coming IELTS test). This mod allows you to backstab and parry like Dark Souls, with detailed MCM settings. *Backstab: When you stand behind someone and attack with melee weapon, it will play a backstab animation and do a huge damage to this one. *Parry: When someone heavy-attacks you, your successful bash can activate a short slow-time effect. During this time your attack will be changed to a counterattack animation and also do a huge damage. You can let it work with normal attack in MCM. 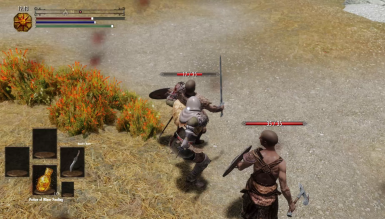 This mod only effects on human NPCs, because FNIS doesn't allow us play a killmove animation to a monster without an instantly killing. The NPCs can use backstab if you turn on the switch in MCM. P.S. We don't have the permission to use the parry sound effect which is showed in this video, so in the real mod we use a sound made by myself. I hope that will not disappoint you. SKYUI: In order to use the MCM menu. FNIS: Please run it after installing Critical Hit. It should be compatible with anything. However, if you use Ultimate Combat﻿ and active its special attack animations, you have a rare chance to meet some soft conflicts, such as incorrect animation interrupting or NPC stuck. It isn't harmful.